We review rock and r&B group Pacanomad. The group consists of members Chantel Rivard (Vocals), Nick Cifaldi on Guitar, Dave Ball on Bass and Zack Stewart rounding out the group on drums. Based out of Ontario, Canada, Pacanomad have just released their EP entitled “Restless”. An EP consisting of tracks loaded with soul, rock, r&b, and lyrics and vocals both full of emotion, these guys may be your cup of tea if you enjoy any of these elements and a band that is actually well put together and seems to know what they’re doing. 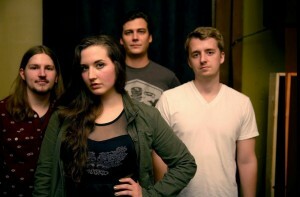 Their sound has been compared to that of a hyrbid of Led Zeppelin and Florence & the Machine. If this sounds like something for you, keep reading for our review of “Restless”. A pleasant blend of rock and soulful lyrics and vocals. Vocally, I’m impressed. And that doesn’t happen often. Normally, when someone compares an artist to another artist, I don’t really see it and I utter a soft “meh”. However, here I do indeed see the comparison to soulful acts like Amy Winehouse and Florence Welch. Heaven Can Wait is such a good song. Like I mentioned before, there is just the right amount of rock and soul here. The song doesn’t come off like its tring too hard to be “rock” or anything other than it is. Because of this, there’s a genuine sound here that succeeds in keeping the listener guessing and most importantly, keeps them wanting to listen. The recommended track, “I Lost You” has a similar sound to the previous track but doesn’t stand out as much. It’s not a bad song at all. In fact, this track features some awesome guitar riffs and solos that have you grooving by the end. While the vocals are still a strong component on this song, the guitar is the stand out element for “I Lost You”. “Restless” starts off slower than the others. Within a few seconds I can already tell this song is going to be full of soul, both lyrically and vocally. There is plenty of emotion here and even a hint of the blues. Once the song picks up a bit before the chorus, I can tell it’s something special. I’m really enjoying this one.